Join the United Neighborhood Organization by running/walking a 5k celebrating el Dia de los Muertos/Day of the Dead. 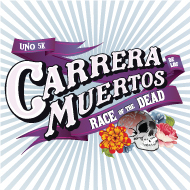 The United Neighborhood Organization’s 8th Annual Carrera de los Muertos/Race of the Dead 5k will be held on Saturday, November 1st at 8:00am. The Carrera de los Muertos/Race of the Dead 5k continues to grow every year! Don’t miss out as this event sells out fast with 5,500 participants. Be part of Chicago’s culturally rich Hispanic traditions in one of the city’s most creative, vibrant and eclectic neighborhood- Pilsen. Register online until October 26, 2014 at www.raceofthedead.com for $47.